I want to set up a custom field where the average area of active peaks over 4 injections is multiplied by a value in CConst1. Formula is A.%..AVE(Area)*CConst1. But I want it to also be applicable to samples where different actives are acquired across different channels. So I have one product where one active is detected at 220nm, and the other at 254nm (two derived channels). If I edit the formula to put SAME in the channel location, will that work for both single channel and dual/triple etc channel products? Can anyone foresee any issue with this? I'm trying to make it as simple as possible. The final formula would become A.%.SAME.AVE(Area)*CConst1. You have multiple actives in a product where each is potentially measured using different channels. The A.%.SAME.AVE(Area)*CConst1 formula should work just fine. Empower won't care if there's 1 or 10 different channels in the data set as it will only look at results of the same channel. Remember to include the summarize custom fields line at the end of your sample sets prior to processing! And just for consideration, while having multiple channels may be necessary, there are ways to further simplify the analysis depending on the skillset of the analysts and your equipment. If the peaks are nowhere near coeluting and you are using a PDA to acquire, you could do something like a timed wavelength in your method set to put all peaks on the same chromatogram which can be very beneficial. You'd then be able to potentially process everything within a single chromatogram. Just something to consider that I've found to be very useful and generally a little easier to manipulate than timed events in the instrument method for acquisition in case peaks are fairly close or move a little from one analysis to the next. I've had an analyst recently come to me with an analysis for 4 analytes. She wanted to maximize sensitivity and so that would then mean that she'd need to use 3 wavelengths (two of the analyte peaks are related and demonstrate similar spectra). She was generating a "full" pda scan (195-350 nm or something like that) anyway, so that meant we had a few options. When she went to process the data, she extracted the 3 applicable wavelength/channels for their components. This wasn't wrong, but it also wasn't very efficient for what she was doing as she had 3 different processing methods and was struggling with quantitation as all 4 analytes were listed in each processing method. Empower was therefore quantitating each analyte for each wavelength. She needed to do something to clean that up, at a minimum, as she didn't want to generate a bunch of invalid results. I suggested that she use a timed wavelength channel for the analysis. In the method set, she was able to derive a channel and, instead of selecting a specific wavelength, PDA: Single Wavelength, I had her choose PDA: Timed Wavelength. 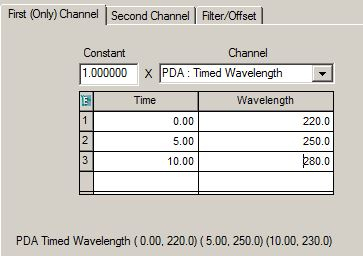 A table generates where you can then enter the applicable values (see attached image of an example, a time vs wavelength table). Then, when she would load the method set in review, she would only get a single chromatogram, thus simplifying all her processing issues and the pain of cycling through multiple channels to review integration and such. Note that there can be some drawbacks depending on the chromatography as it can result in a "step" in the baseline at the time(s) of the transitions which is why you need to have decent resolution between analyte peaks. Thanks very much for the answer. I was thinking the SAME wouldnt make a big difference but thought it wise to get a second opinion. I do actually run a pda method which analyses two actives both at different wavelengths. I have derived channels for this. How does a timed wavelength work? Thanks very much for that MJS, I appreciate you taking the time to share that procedure. I never knew you could do that, I always used the single wavelengths derived channels and left it at that. I will look into this as I have 2 actives, as you said would have to evaluate if any dips would affect peaks in close contact. Thanks again! If you only need 3 wavelengths scattered through the course of each injection and the peaks are all well resolved, you can also use the events table in the instrument method of a TUV (or PDA w/ 3D shut off) to change wavelengths during each injection. The advantages to this are that you have only one channel per injection to look at and you are not loading up your server with large PDA files.